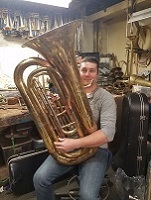 For you BBb tuba quintet players (and sure: polka band, jazz band, and "lame back" issues), finally here's a medium-large bore (.689" - .728") 4-piston front-action 3/4-size tuba outfit that is really high-quality, and does ~NOT~ cost (eek!) ̶$̶9̶0̶0̶0̶. Instead, it will be priced somewhere in the conservative $2XXX range. just fwiw, It's supplied with a John Packer mouthpiece that's quite a bit similar to a Wick 4. Send me an email or message for confidential pricing. That's pretty sweet. I will have to drag some of the band directors I know over to the Packer booth and show it to them. I get asked all the time about small durable instruments that have four valves. Mark Finley wrote: That's pretty sweet. I will have to drag some of the band directors I know over to the Packer booth and show it to them. I get asked all the time about small durable instruments that have four valves. ...and notice, please, that the bore is NOT .656", .658", or .661", and ~IS~ .689" - .728"
It looks like the pull on the 4th valve slide is about a quarter mile long! I bet playing low C's and B's down to the pedal range wouldn't be hard with your left hand on that slide. 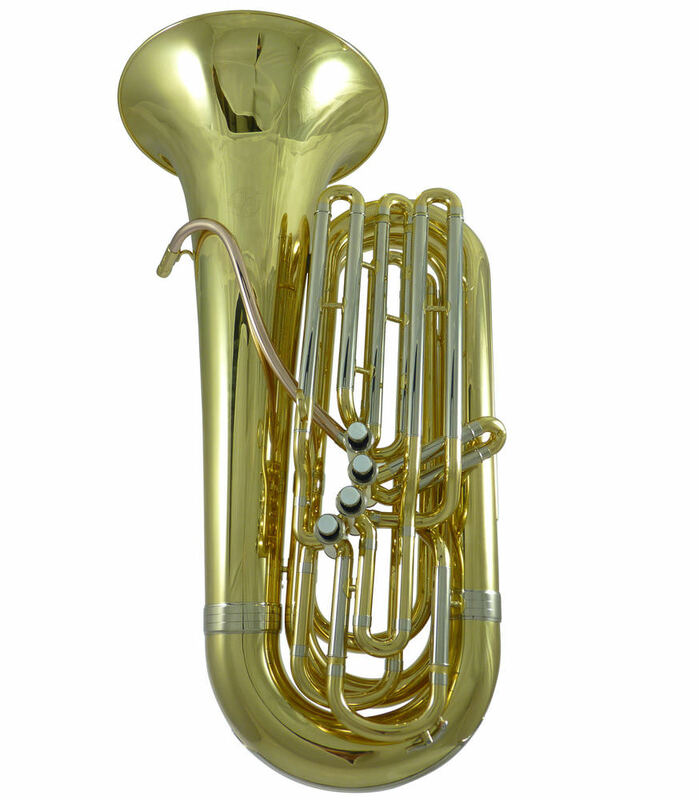 Have you spent any time playing this horn? Do you have one in your possession? Just wondering about the layout in regards to water collection. Looks like all the water in the valve loops have to come out the top after pulling slides. Or am I missing something? Just thinking about the kids. Looks like a fun little horn, though. If you get a chance to play I'd be interested in any intonation problems you encounter like you had with the similar, small Eastman. Full report coming up and less than a month! I'll try it myself Friday, 02/02/2018!! ...even though my name isn't Frank. Then this is the report I'm interested in. Actually want to try one myself, I have a Neo but would like a toy too! Candidly, this one did not impress me. I'd like to play another (and another and another) and see if they're the same. It may well (??) have been something as stupid as "some of the packing material having fallen down inside the instrument"...?? It sorta played like that. The bugle is extremely similar to the Yamaha 10X/621 bugle, so it should play much better than it was playing for me. Three Valves wrote: I'll try it myself Friday, 02/02/2018!! It even played in tune once I figured out how the slides worked. But compared to the 379B piggy-like model, the 379B piggy model is the way to go. It's not much larger at all, but feels and sounds much better. I'm happy to report that I just played one at the packer booth at TMEA, and it was a winner. I don't know what was wrong with the one that they sent to DC with Joe, but this one played very nice. I found one note on it (d below the staff) that I thought played out of standards, but other than that it was impressive in every way. FYI I spent only a little time playing the one with Joe and more time with the one at Balt Brass. Mark Finley wrote: I'm happy to report that I just played one at the packer booth at TMEA, and it was a winner. I don't know what was wrong with the one that they sent to DC with Joe, but this one played very nice. I found one note on it (d below the staff) that I thought played out of standards, but other than that it was impressive in every way. I know I'm saying the same thing that I said before, but I'm still thinking that (re: the one at the Army conference) some packing crap must have fallen down into the bell and made its way around the corner of the bow and out of sight. HEY ROB... If that particular one gets sold, please encourage it's buyer to run water through it from the large side of the tuning slide and out the bell. Let me know if you're interested, and I'll shoot you a really great price that includes shipping. I have to say, this thing is about 1k+ less than a comparable Jupiter and it does not sound or feel 1k+ less. Looks like folks aren't going to have to figure out how to graft a fourth valve on a Yamaha 103 any more. ...and the primary bore is .689" with a .728" 4th valve. NICE CASE & SHIPPING included in the pricing. notice: PLENTY of 1st valve slide tubing for a low Eb.